roots – Radio for the People, by the People. Tune inn to The Rasta Vibration Show tonight in Studio 1A! Dj Irie Selecta spinning the best new reggae music from 7-10pm(pst) Live in Studio 1A! Make sure to tune inn to The Rasta Vibration Show with Dj Irie Selecta tonight on Fcc Free Radio! We have an all vinyl show coming your way tonight. Dropping songs off of Albums from Lt. Stitchie & Johnny Osbourne and all kinds of track on wax… Tune inn 7-10pm(pst) Live in Studio 1A!!! Tune inn to The Rasta Vibration Show tonight on Fcc Free Radio!!! We will be dropping a bunch of new reggae tunes tonight, Plus we will be playing tracks off of Lp’s from Barrington Levy & Tony Rebel! It all goes down 7-10pm(pst) with Dj Irie Selecta Live in Studio 1A!!! Tune inn to The Rasta Vibration Show with Dj Irie Selecta tonight on Fcc Free Radio! Junior Reid will be calling in to talk about his music and show tomorrow night and we have a bunch of new reggae music to play! Tune inn and fire up 7-10pm(pst) on www.fccfreeradio.com Live in Studio 1A!!! 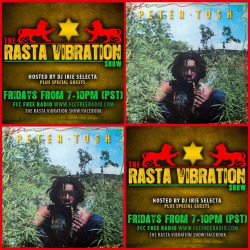 Tune inn to The Rasta Vibration Show with Dj Irie Selecta tonight! Lots of new tunes and riddims dropping tonight, Plus tracks off of Lp’s from Freddie Mcgregor and John Holt! Tune inn 7-10pm(pst) Live in Studio 1A!!! Make sure to tune inn to The Rasta Vibration Show tonight with Dj Irie Selecta on FCC Free Radio. We have a bunch of new singles and riddims to drop and Al Pancho will stop by to talk about his new music and upcoming shows! It all goes down 7-10pm(pst) Live in Studio 1A! Tune inn to The Rasta Vibration Show tonight with Dj Irie selecta on FCC Free Radio! We have 3 hours of reggae music coming your way plus we have Dj Kali passing by to take over the last hour! Tune in 7-10pm(pst) Live in Studio 1A! Tune inn to The Rasta Vibration Show tonight on FCC Free Radio! Dj Irie Selecta digging deep in the crates as we have an all vinyl show bumping thru the speakers tonight. We will also play tracks off of these 2 Lp’s as well! Tune inn 7-10pm(pst) on www.fccfreeradio.com Live in Studio 1A! Tune inn to The Rasta Vibration Show on FCC Free Radio tonight!!! No long talking just reggae music we a push! Got some new singles and riddims and we are playing some oldies as well! Tune inn with Dj Irie Selecta 7-10pm(pst) Live in Studio 1A!!!! Make sure to tune inn to The Rasta Vibration Show tonight on FCC Free Radio! We will have the article Sammy Dread live in studio to talk about his music and up coming shows! Plus we will have guest Dj Keyz live in the mix! It all goes down 7-10pm(pst) Live in Studio 1A! Phantom Hi-Fi Soundz taking over The Rasta Vibration Show tonight on FCC Free Radio!!! Make sure to tune inn… 7-10pm California time….. www.fccfreeradio.com Live in Studio 1A!